The last few weeks we’ve been practically eating our weight in stone fruits. Peaches, nectarines, plums… we just can’t get enough. We’ve been eating them straight up, in cobblers and crisps (recipe coming soon! ), and in this luscious vegan ice cream I’m sharing with you today. The addition of raw cashew butter takes an already delicious summer (n)ice cream to the next level. It makes it rich, creamy, and whippy. Oh yes, friends, you need this in your life. All you need is a food processor or high speed blender, a few minutes of your time, and 4 healthy ingredients, and you’re on your way to vegan ice cream bliss. Enjoy! Take your frozen fruit out of the freezer and allow to soften for about 5 minutes, just so it isn’t rock hard. 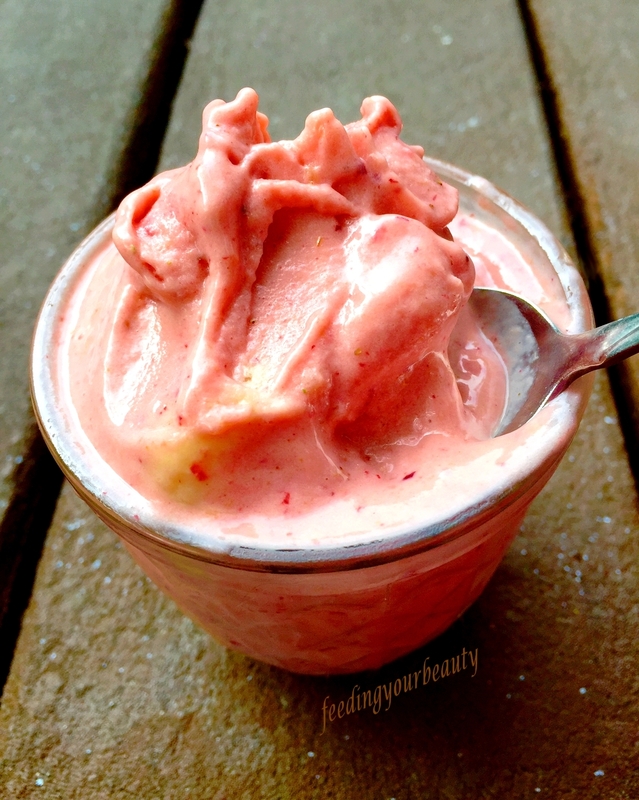 If using a high-speed blender, place the fresh nectarine and cashew butter in first and frozen fruit on top. If using a food processor, spread ingredients around the bowl evenly. Blend until smooth (use tamper with Vitamix, scrape sides down with food processor). Add splash of almond or cashew milk if needed. *Feel free to substitute fresh peaches for the nectarines. **Raw almond butter would work as well. The additional sweetener is optional, if you’re using very ripe fruit, you probably won’t need it. Mmmmmmm we bought a case of bananas a couple weeks ago and froze a bunch. I’ve been making so many variations of banana ice creams!!! I can’t believe I haven’t yet used my seasonal favorite fruit: peaches!!! Thanks for the inspiration!